I present to you ASTRO! He's a 9 mo. old pup; very energetic, great with my 3 kids (6, 8, 10 yrs old), my lovely wife, and very protective of my youngest! What's different about Astro as you can see are his eyes/look AND coat color. ASTRO has been very patient with me since I got him as a 7.5 week puppy. I say that because I've never owned a dog before and I had to learn a lot about GSD's. His accomplishments include wining first place (out of 7 dogs young and adult) at a beginners puppy training class when he was only 6 mo. old, which earned him an automatic registration with the AKC as a STAR puppy. He has also learned how to follow commands with hand signals (sit, stay, down, jump, shake).. In fact, he loves to jump from ground up to a trampoline and benches every time I signal the command! Last thing about Astro.. I love his protective nature. The other day I took him and the family to a park/reservation where he was able to roam free and put his instincts to work! I was up front with Astro, and my wife and kids in the back. As we walked, Astro would go to the front of the "pack" as if he was scouting, then he would pause to look back (as he was doing a head count) and go all the way to the back of the pack. Every time my youngest would get out of the track, he would leave the line and get close to him. I thought that was very interesting behavior for a young pup and of course I was very proud. I hope you guys will find ASTRO a unique GSD as I do.. he deserves to be the pup of the month! Yes, ASTRO is a "space name" :) Thank You btw for your comment Julie. Have a wonderful day! Congrats Erick i love the name it sounds like from the space is that right? Is something related to it? Thank you so much for your comments! As you said I'm sure Astro will turn out into a handsome GSD and I promise I'll take good care of him. Thank you so much for your comments! I'm sure like you said Astro will become a handsome GSD, so I promise, I will take care of him. BTW I was trying to check out MIA's website, but the links take me elsewhere. If you could share the direct link to MIA's page would be great. Again thank you and please take care! Astro, what a cutie and will grow into a Handsome adult! You sound like a very Proud papa when you wrote about Astro. German Shepherds are very protective and it starts in their puppyhood. He has my vote. I have a beautiful female Shepherd, Mia, and she loves her balls, playful,obedient but always protective no matter what. 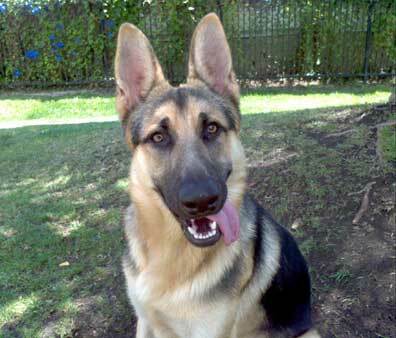 You can read our stories TGS website total german shepherd Puppy Mia Story and Mia My Beautiful German Shepherd Dog. Take care of your boy and he will Always take care of you!